“We’re meeting with the doctors and stuff tomorrow after the game, and then I think they’re going to assess whether he would start skating later on in the week,” Goaltending Coach Bill Ranford said. There’s no clear timetable yet on when Quick might return. He’s two weeks deep in his rehabilitation from surgery to repair a torn meniscus that was expected to keep him out of games for three or four-to-six weeks, so any assessment on when his recovery may shift onto the ice is just a preliminary starting point. Quick has appeared in four games this season, going 0-3-1 with a 4.55 goals-against average and an .845 save percentage. The plan as of Monday morning was to charge full steam ahead with Budaj and Petersen as the two goaltenders. Given that Cole Kehler is injured, they’re the organization’s only two healthy NHL goalies playing professionally under NHL contracts. –Desjardins noted that Marco Sturm is scheduled to arrive in Los Angeles tonight and will be at the rink tomorrow. Los Angeles concludes its seven-game home stand against Toronto Tuesday night before traveling for a three-in-four Central Division road trip at Chicago, Nashville and St. Louis. The Chicago and Nashville games represent the team’s first back-to-back set of the season. 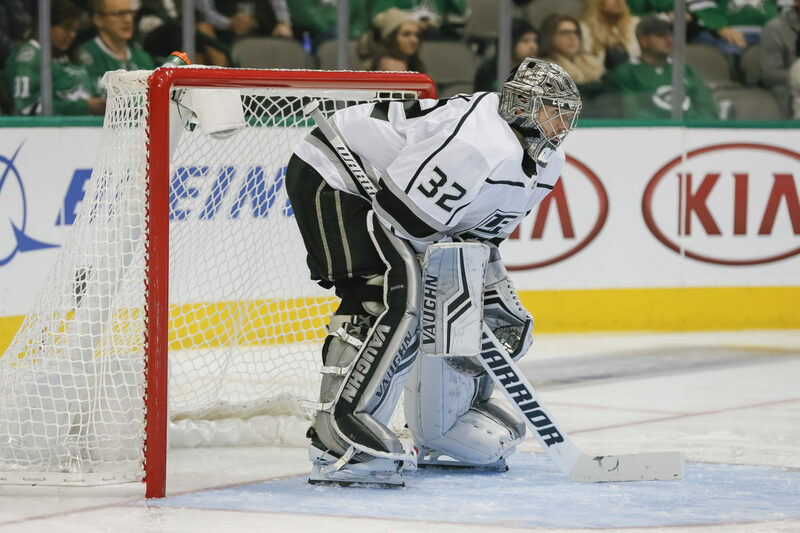 Next Post » How will Budaj and Petersen split time? Will the team’s style change?